Spartan Whey is a protein powder from Sparta Nutrition that is promoted heavily with great tasting flavors. After being on the market for a number of months now we’ve finally managed to get our hands on a few tubs to find out if Spartan Whey tastes as good as its flavor graphics look. For those interested in the finer details of Sparta Nutrition’s protein powder, it is a relatively lean product providing 25g of protein with just a gram of fat, 2g of carbs, and 110 calories. The supplement’s protein comes from a fully transparent blend of whey isolate, whey concentrate, and micellar casein, which sits alongside a 25mg dose of the absorption enhancer AstraGin. All of the Spartan Whey flavors have a strong, thick consistency that makes them feel like a traditional milkshake. We’ve experienced this kind of thickness in a lot of other protein powders and have always appreciated the enjoyment it brings to any flavor. The good thing about Spartan Whey however, is that its thickness isn’t all there is to it. To compliment Spartan Whey’s milkshake-like consistency, the product also features light, but impressively sweet and satisfactory flavors. We’ve had the pleasure of trying two of its cereal options in Loopy Froots and Jacked Apples, as well as Peanut Butter Cups and Crunchy Krisp which we liked just that little bit better. 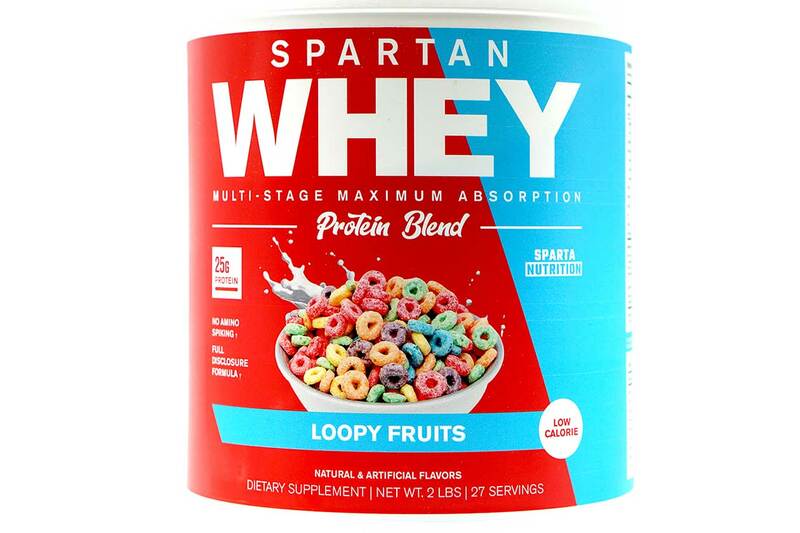 While Spartan Whey’s Loopy Froots and Jacked Apples are certainly enjoyable and deliver on their title tastes quite obviously. The Peanut Butter Cups and Crunchy Crisp have a more complete flavor experience as they really play into that milkshake thickness. The Peanut Butter Cups Spartan Whey has a sweet peanut butter taste to it that combined with the thick consistency makes for a very pleasant shake. As for the Crunchy Crisp Spartan Whey, that one actually tastes like a smooth mix of chocolate and caramel, with the latter flavor being the one that stands out the most. We have to say we’re actually impressed with Sparta Nutrition’s Spartan Whey. We were expecting the supplement to be a great tasting whey protein, which definitely isn’t bad, although that’s something we’ve had many times before. Spartan Whey instead mixes things up by being a protein that tastes great, but it does it quite differently. Where the flavorsome Sparta Nutrition protein powder truly sets itself apart is as mentioned, with its thickness and sweetness. We have seen milkshake like thickness before in supplements, however not in combination with the sweet and obvious tastes that come with Spartan Whey.